#0145 – Visual Studio, SQL Server Express Editions, Visual Studio Lightswitch – they are licensed & free! Often, students and colleagues come up to me and enquire how do they get started learning about some of the newest technologies. They generally do not seem to have issues with getting the study materials (most common study materials are the many blogs on the Internet and MSDN documentation). The one thing they do have issues with is procuring software to practice their skills on. The most attractive part about these “Express” editions is that they are free. However, the salient benefit is that these editions are covered by Microsoft support. They are eligible for automatic product upgrades and you can get all the technical support that you would need. The other benefit is that you now own a licensed product for free. Isn’t that a wonderful? I use them on my test system at home, and have never felt the need for more. 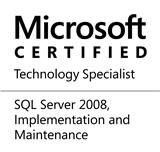 This entry was posted in #SQLServer, Blog, Imported from BeyondRelational and tagged #SQLServer on March 22, 2012 by nakulvachhrajani. Students should also check out [DreamSpark.com] – Just FYI: Students gets software’s like VS professional 2010, SQL Server08 r2 developer, etc for Free!